My husband has made Ceviche for many years. I had never eaten or heard of it before I met him. According to Wkipedia, Ceviche or seviche is is a seafood dish popular in the coastal regions of the Americas, especially Central and South America. The dish is typically made from fresh raw fish marinated in citrus juices such as lemon or lime and spiced with chili peppers. You can also add spices and onions. The acid in the citrus juices actually "cooks" the fish, so no heat is needed. 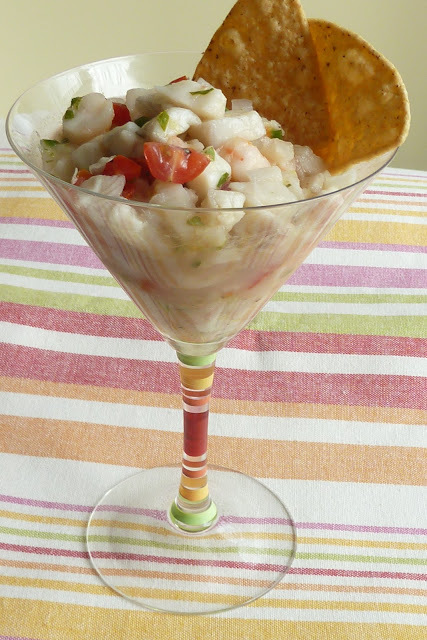 There are many different versions of ceviche, and the version my husband uses both shrimp and whitefish. He used Tilapia for the white fish, but you can use sea bass, or any lean white fish. Whatever version of ceviche you use, it is really good, and perfect for appetizers, or a light lunch or dinner. You feel the tropical sun and light breezes blowing, as you eat the ceviche. Just what we need to chase away the winter blues. I was reading Chef and the Steward chefandsteward.com blog about Escaveitch, and thought that it was time for Ceviche. Lij, the Chef, commented back that he couldn't wait until I posted the Ceviche, and Jamaican.Rum. wait no more Mon, because here it is.My husband discovered Jamaican Rum, when he was in the Navy and in the Caribbean.He fell in love with the Islands and the rum. He visited most of the Islands and we have been on Windjammer cruises, which were small ships with only about 140 people, triple masted, that sailed in the Caribbean.. That line is now out of business, much to the dismay of my husband. So have a drink of Jamaican Rum, eat some Ceviche, and dream of the Caribbean. Combine fish, 1/3 cup lemon juice, 1/3 c. lime juice, 1/2tsp salt, and oregano. Marinate in refrigerator for 2 hours. Drain juice completely. Place drained fish a Mason jar, or any other large glass a jar with a lid. Combine remaining 1/3 c. lemon juice, 1/3 c. lime juice, olive oil, white pepper, cumin, tomato, onion, vinegar, shrimp, jalapeno chile, and cilantro. Stir well. Add to drained fish in a large jar. Put on lid and shake jar to distribute liquid. Marinate in refrigerator 8 hours or overnight. Ta Da! And the Award goes to.... Now see I didn’t know that I was receiving these awards, so I didn’t have time to get my gown made, my hair done, or order the limo, so you won’t be seeing me on TV Sunday night. I was the fortunate recipient of the Stylish Blogger Award from Kim and Kim. One was from Kim at Liv Life, a beautiful blog with gorgeous pics, and delicious recipes, as well as wonderful stories about her family and her pups. She is fortunate to live in Southern California, so I can be jealous of all of the wonderful weather out there. 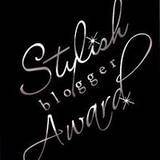 I received another Stylish Blogger Award from of the Farmer’s Wife. Kim is really married to a farmer and they have a Farmer Tot, who is her sous chef.. A lot of her recipes are family oriented, kid friendly, and she bakes beautiful bread. Please stop by and visit their wonderful blogs. I am so honored to have received the award from such wonderful people, who have such lovely blogs. Now the rules say that you must tell 7 things about yourself, and pass the award on to ten people, so here goes. 1. I love College Basketball and March Madness. I will be filling out my brackets and so will my granddaughter. 2. This Sunday, Feb 27th, I am going wedding dress shopping with my future daughter-in-law, and her Mom. I am so excited! 3. I am the oldest in the family and have 2 brothers, 10 & 12 years younger than me. 4 .My favorite movies are Back to the Future, When Harry Met Sally, and Cinderella. 5. I have a niece, .a nephew, and a granddaughter, all born within two weeks of each other. They turn 18 in June! 6. I love guacamole, and could eat it every day, especially with mango salsa. 7. My husband loves to cook, but he is also an artist. More exciting news coming soon. I'm passing on this award to these wonderful blogs who deserve this award! Please stop by and say Hi! Oh I just love ceviche. Some nights we eat it over greens as dinner. This a a fabulous recipe! Sommer-Eating it over greens would be a good way to eat it too. Becky this is a beautiful recipe. I love ceviche especially with such fresh ingredients. I also adore the way you served it. So clever! I'm honored you asked me to accept this award. Thank you so much! Oh I just love you! I love that you love guacamole and that you like Back to the Future! I'm so very happy that you are going wedding dress shopping with soon-to-be relatives!! How very exciting!! Your awards are certainly deserved. Much love to you! Becky, Your Ceviche looks so good! We used to make this at the cafe I worked at, it was very popular! Thanks for the sweet words about my blog! You deserve these awards! First congrats on the award..you deserve it darling! And your Ceviche looks stunning! Fantastic presentation and photos! Thank you so much for all of your comment. I certainly appreciate yoor support and your blogger love! Becky thank you for an honour of this amazing award! You just made my day! Have no idea what Ceviche is but it looks fantastic, would surely eat it clean! THANK YOU!!!! I am so grateful and so honored to know that you think I deserve this blog award. What a great way to start the weekend! Hi lovely lady! I just started eating ceviche a few years ago...and I love it! I've never made it before, so I'm glad you shared your recipe. And I loved what you shared about yourself! I adore Harry Met Sally too! Thanks for your post, sweet lady. I hope you have a splendid weekend full of sleep, laughter and love! A lovely and flavorful ceviche there, excellent! Congrats on your award! We are soooo very honoured by this post! You touched both our hearts so! We are sooo out of Jamaican rum and are right there taking one in spirit (pun intended). We will let you know once we post our reply! That ceviche looks great too! You can also make it with conch too! 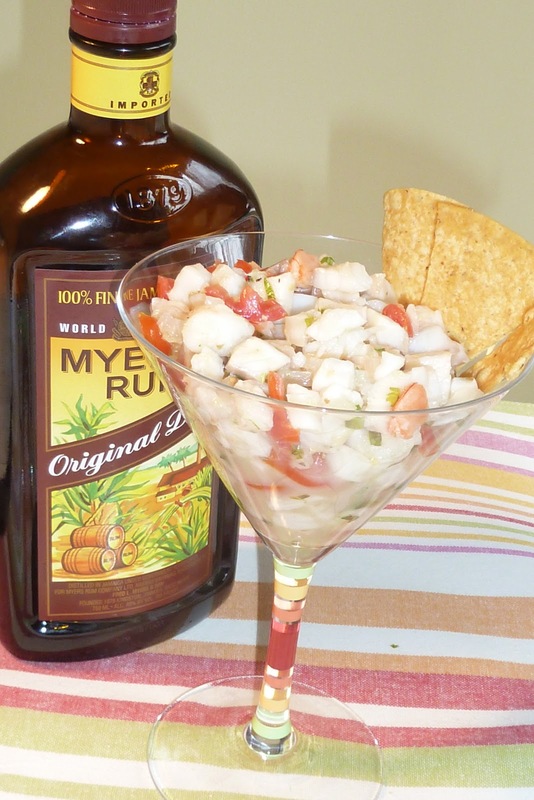 That is the national dish of many of the Northern caribbean islands (the conch ceviche).. they call it conch salad though, if I remember correctly. Congrats on the future wedding, mother of the groom! Lovely to hear! Great also that you have such a close relationship with your daughter in law! "When Harry Met Sally" is one of my ALL TIME faves too! So we have a love for the Caribbean, food, husbands who cook, rum and now that in common!